Potash mining is an important economic activity in the north-east of Spain. However, one of the main environmental issues produced for such type of mining is subsidence, which generates horizontal and vertical ground displacements. 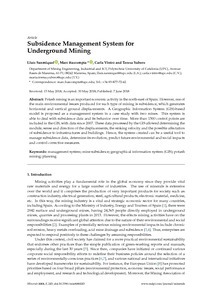 A Geographic Information System (GIS)-based model is proposed as a management system in a case study with two mines. This system is able to deal with subsidence data and its behavior over time. More than 1300 control points are included in the GIS, with data since 2007. These data processed by the GIS allowed determining the module, sense and direction of the displacements, the sinking velocity and the possible affectation of subsidence to infrastructures and buildings. Hence, the system created can be a useful tool to manage subsidence data, determine its evolution, predict future environmental and social impacts and control corrective measures. Sanmiquel, L., Bascompta, M., Vintro, C., Yubero, M. Subsidence management system for underground mining. "Minerals", 7 Juny 2018, vol. 8, núm. 6, p. 1-13.